Former president Pervez Musharraf says the US military aid given to Pakistan during his tenure was used to strengthen defences against India. The money was used to arm the troops who moved with their equipment from the western border to the east based on the perceived threats, he said. The US gave $10bn dollars to Pakistan to fight the Taliban and al-Qaeda. In 2007, Pakistan rejected a report which said it had used $5bn on weapons systems designed to fight India. Pakistan's military had described the New York Times report as "nonsense". "Wherever there is a threat to Pakistan, we will use it [equipment provided by the US] there. If the threat comes from al-Qaeda or Taliban, it will be used there. If the threat comes from India, we will most surely use it there," Mr Musharraf told Pakistan's Express News television channel. "There is nothing like this equipment has come from the US and must only be used against Taliban, or that equipment has come from China and must be used against this or that," he added. 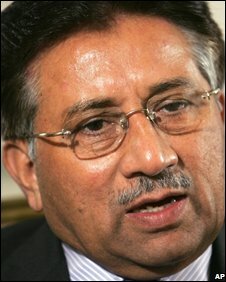 Mr Musharraf confirmed that the weapons were indeed used against India. "We did right. What we did, we did right. We have to ensure Pakistan's security. From whichever side the threat comes, we will use the entire force there." Mr Musharraf said he did not care if this diversion of aid angered the US. "Whoever wishes to be angry, let them be angry, why should we bother? We have to maintain our security, and the Americans should know, and the whole world should know that we won't compromise our security, and will use the equipment everywhere." Meanwhile, India said Mr Musharraf's statement merely confirmed "what we have suspected over a long time and what we have suggested all along". "We do not feel that such assistance should be turned around and used against us," news agency Reuters quoted India's junior external affairs minister Shashi Tharoor as saying. "We pose no threat to Pakistan and we find that this kind of diversion is neither in the interest of the sub continent nor of those who are giving this assistance." This is the first time Pakistan has admitted to diverting the US aid to strengthen its defences against India. In the past, Pakistan's army has dismissed claims that aid from the US had been misappropriated.